Influenza A virus (IAV) is a major respiratory pathogen of both humans and animals. The lung is protected from pathogens by alveolar epithelial cells, tissue-resident alveolar macrophages, dendritic cells, and mast cells. The role of alveolar epithelial cells, endothelial cells, and alveolar macrophages during IAV infection has been studied previously. In this study, we address the role of mast cells during IAV infection. Respiratory infection with A/WSN/33 causes significant disease and immunopathology in C57BL/6 mice but not in B6.Cg-KitW-sh mice, which lack mast cells. During in vitro coculture, A/WSN/33 caused mast cells to release histamine, secrete cytokines and chemokines, and produce leukotrienes. Moreover, when mast cells were infected with IAV, the virus did not replicate within mast cells. Importantly, human H1N1, H3N2, and influenza B virus isolates also could activate mast cells in vitro. Mast cell production of cytokines and chemokines occurs in a RIG-I/MAVS–dependent mechanism; in contrast, histamine production occurred through a RIG-I/MAVS–independent mechanism. Our data highlight that, following IAV infection, the response of mast cells is controlled by multiple receptors. In conclusion, we identified a unique inflammatory cascade activated during IAV infection that could potentially be targeted to limit morbidity following IAV infection. The initial lines of defense in the respiratory tract include alveolar epithelial cells, endothelial cells, tissue-resident alveolar macrophages, dendritic cells, and mast cells. However, the role of mast cells during respiratory infections is an understudied area (7). Mast cells are tissue-sentinel cells of hematopoietic origins found in most vasculature tissue, but they are enriched in tissues that are at environmental interfaces, such as skin, gastrointestinal tract, urinary tract, and lungs (8). This localization is significant because mast cells are poised to play an important role in the early immunosurveillance for pathogens. Mast cells express numerous molecules that can recognize pathogens, including CD48, FcR, complement receptors, TLRs, RLRs, NLRs, and CLRs (9). After activation, the mast cell response can be separated into two distinct phases: immediate degranulation and secretion of stored mediators and delayed secretion of de novo–synthesized mediators. The immediate response is characterized by release of histamine, serotonin, tryptases, chymases, and TNF-α, whereas the delayed response includes secretion of leukotrienes, PGs, cytokines, chemokines, and growth factors (10). Interestingly, mast cells do not respond uniformly to all stimuli. Stimulation of TLR4 by LPS causes mast cells to facilitate a strong inflammatory cytokine response but not degranulation; in contrast, TLR2 activation results in both inflammatory cytokine release and degranulation by mast cells (11). Thus, the mast cell response is extremely adaptable, which enables them to have dramatic effects on the composition and regulation of subsequent inflammatory responses. It is well documented that mast cells play a crucial role in immunity against certain parasitic and bacterial infections (reviewed in Refs. 8, 9, 12). More recently, the role of mast cells during viral infections has been explored. In vitro, mast cells were shown to be capable of responding to vesicular stomatitis virus, Sendai virus, Hantavirus, dengue virus, and reovirus (13–17). However, there is a limited understanding about the in vivo relevance of mast cells during viral infections. In a peritonitis model of Newcastle disease virus infection, mast cells were shown to be important in inflammatory cell infiltration in a TLR3-dependent manner (18). During cutaneous dengue virus infection, mast cells were shown to play an important role in immunosurveillance through RIG-I– and Mda5-dependent recognition of the virus (19, 20). In humans, dengue shock syndrome was recently associated with elevated serum levels of mast cell–derived VEGF and proteases (21). Additionally, mast cells were shown to play a protective role during skin vaccinia virus infection (22). However, the in vivo relevance of mast cells during respiratory virus infections remains understudied. IAV was shown to enhance IgE-mediated histamine release from basophilic leukocytes, but IAV alone caused minimal histamine release (23). Moreover, IAV infections can sensitize mice, leading to flu-specific cutaneous anaphylaxis (24). Together, these data demonstrate that IAV infection can have effects on mast cells, but it remains unresolved whether mast cells are important in the inflammatory response to respiratory IAV infection. In this study, we specifically demonstrate that mast cells play an important role in the pathological response during A/WSN/33 infection of mice. Importantly, mast cell activation was also observed with human influenza virus isolates from the H1N1 IAV, H3N2 IAV, and influenza B virus families. The ability of IAV isolates to activate mast cells correlated with their ability to infect those cells in vitro. Interestingly, upon infection, cytokine and chemokine production by mast cells was entirely dependent on RIG-I signaling, whereas mast cell degranulation occurred, even in the absence of RIG-I signaling. Thus, we demonstrate that mast cells can play a central role in the inflammatory pathology induced by IAV infection. Allantoic fluid containing the A/Puerto Rico/8/34 virus was purchased from Charles River. Allantoic fluid containing the A/WSN/33 virus was originally obtained from Dr. David Topham (University of Rochester, Rochester, NY) and was subsequently grown in embryonated chicken eggs. Human influenza virus isolates used in Fig. 5 were obtained through the National Institutes of Health Biodefense and Emerging Infections Research Resources Repository, National Institute of Allergy and Infectious Diseases, Bethesda, MD. B6.Cg-kitW-sh mice were originally purchased from The Jackson Laboratory and were subsequently bred in-house. C57BL/6J mice were bred in-house. Specific knockout bone marrow was kindly provided by multiple investigators: RIG-I by Dr. Michael Gale (University of Washington, Seattle, WA), MAVS by Dr. Matthias Schnell (Thomas Jefferson University, Philadelphia, PA), MYPS/STING by Dr. John Cambier (National Jewish Health, Denver, CO), CARD9 by Dr. Tobias Hohl (Fred Hutchinson Cancer Center, Seattle, WA), and STAT6 by Dr. Daniel Campbell (Benaroya Institute, Seattle, WA). Mice were infected intranasally with 1500 PFU A/PR/8/34 or A/WSN/33 under 2,2,2-tribromoethanol (Avertin) anesthesia. At the indicated times after IAV infection, mice were given a lethal overdose of pentobarbital. Bronchoalveolar lavage fluid (BALF) was collected by washing the lungs with 2 ml PBS containing 50 mM EDTA. Lungs were saved for viral titers and stored at −80°C. BALF was spun down, cells were analyzed by cytospins, and BALF supernatant was analyzed using a lactate dehydrogenase kit (Promega) and BCA assay (Thermo Scientific). For weight loss studies, mice were infected as previously stated and weighed daily. All animal protocols were approved by the Montana State University Institutional Animal Care and Use Committee. IAV viral titers in the lungs were quantified using a standard plaque assay. Briefly, lungs were homogenized in 2 ml medium using a dounce homogenizer. Next, 10-fold serial dilutions of the lung homogenates were plated in duplicate on MDCK cells (American Type Culture Collection) in a six-well plate (dilutions 10−1 to 10−6). Virus was left to adhere to the cells for 1 h at 35°C, tipping every 10 min. Cells were overlaid with 2 ml 0.8% SeaKem agarose (Lonza) in DMEM containing 0.5 μg TPCK trypsin (Worthington) and 0.2% BSA (Millipore). Plates were incubated at 35°C for 3 d, after which they were fixed overnight by adding 3 ml 1:1 methanol/acetone. After fixation, monolayers were stained with 0.1% crystal violet. Lungs were inflated with 10% buffered formalin phosphate, placed in the same solution for ≥24 h, and then embedded in paraffin. Five-micron sections were stained with H&E to assess lung inflammatory cell infiltration. H&E-stained lungs were observed on an upright 80i eclipse microscope, and images were captured with a DS Ri1 color camera (both from Nikon). Bone marrow–cultured mast cells (BMCMCs) were grown as previously described (25). Briefly, femurs from 4–8-wk-old mice were removed, and bone marrow cells were collected by centrifugation for 30 s at 5000 rpm. Cells were resuspended in RPMI 1640 supplemented with 1% nonessential amino acids, 1 mM sodium pyruvate, 2 mM L-glutamic acid, 50 mg/l gentamycin, 100 U/ml penicillin/streptomycin, 20 mM HEPES, 10% FBS, and 0.1% 2-ME. For the first 3 wk, the cells were incubated with 10 ng/ml recombinant murine IL-3 (PeproTech). In subsequent weeks, 25 ng/ml recombinant murine stem cell factor (PeproTech) was added along with IL-3. After 5 wk, the purity of the population was >90% mast cells, as determined by flow cytometry analysis using anti-FcεR1α and anti-CD117 (both from BioLegend). To generate BMCMC knock-in mice, we followed the methods used previously (26–28). Briefly, BMCMCs were generated as described above. Mice 3–4 wk of age were reconstituted with 5 × 106 BMCMCs via i.v. injection and rested for ∼8–10 wk before use. For activation assays, 2.5 × 105 BMCMCs were plated/well in a 96-well U-bottom plate. Virus was added at a multiplicity of infection (MOI) ∼ 1, and the final volume was brought to 100 μl and incubated for 4–6 h. As positive controls, BMCMCs were stimulated with LPS (5 μg/ml; List Biologicals Laboratory) for cytokine/chemokine release or the calcium ionophore A23187 (40 nM; Fisher Scientific) for leukotriene synthesis and mast cell degranulation. Additionally, naive allantoic fluid could not activate the BMCMCs, similar to medium alone (Supplemental Fig. 1). In vitro BMCMC–activation assay supernatants from 4–6 h posttreatment and BALF from the indicated time points were analyzed for cytokine and chemokines, according to the manufacturer’s instructions. Custom Milliplex plates were used for cytokine and chemokine analyses (Millipore), whereas murine IFN-α and IFN-β were measured using Procarta 2-plex assay (Affymetrix). Plates were read using a Bio-Plex 200 (Bio-Rad). Histamine and leukotriene B4 (LTB4) enzyme immunoassays (EIAs) were conducted, following the manufacturer’s instructions (Cayman Chemical). Briefly, the samples were incubated with an acetylcholinesterase-linked histamine or LTB4 tracer for 24 h or overnight, respectively. Plates were washed, and Ellman’s Reagent was added to detect the tracer-labeled histamine or LTB4. Obtained results are inversely proportional to free histamine or LTB4 present in the well. To measure virus infectivity of mast cells, we stained BMCMCs looking for intracellular expression of the NS-1 protein. Briefly, 2.5 × 105 BMCMCs were plated/well in a 96-well U-bottom plate. Virus was added at MOI ∼ 1, and the final volume was brought to 100 μl and incubated for 4–6 h. The cells were then fixed with 100 μl BD Cytofix/Cytoperm (BD Biosciences) for 30 min. Cells were then stained with a mouse mAb against the IAV NS1 protein (NS1-1A7; BEI Resources) for 30 min in BD Perm/Wash Buffer. Subsequently, the cells were washed with BD Perm/Wash Buffer and then stained with PE-labeled goat anti-mouse IgG F(ab′)2 fragments (Jackson ImmunoResearch Laboratories). Cells were then washed with BD Perm/Wash Buffer and resuspended in FACS Buffer. Samples were collected using a FACSCalibur and analyzed via FlowJo software. Statistical significance was determined by a Mann–Whitney U test or one-way ANOVA using Prism 5 (GraphPad Software). Significance was set as p < 0.05. Mast cells are crucial participants in the immune responses to parasitic and bacterial infections (8, 12). Recently, the role of mast cells during respiratory infection with bacterial pathogens has begun to be explored (29–31), but their role during respiratory infection with viral pathogens remains understudied. IAV was reported to enhance IgE-mediated histamine secretion from basophilic leukocytes, but those studies failed to observe any direct activation of mast cells by IAV alone (23). Furthermore, genetic analysis of lungs from mice infected with a model strain of the 2009 IAV pandemic virus demonstrated an enrichment of genes associated with mast cells (32). Thus, we looked to address the role that mast cells might play during IAV infections. To assess the role of mast cells during respiratory infection with IAV, 10–12-wk-old B6.Cg-KitW-sh mice, which are known to have a mast cell deficiency (26), and C57BL/6 mice were infected with 1500 PFU of A/WSN/33. Body weight of individual animals was monitored longitudinally for 2 wk. When infected with A/WSN/33, B6.Cg-KitW-sh mice did not lose substantial amounts of their initial body weight, whereas C57BL/6 mice displayed significant weight loss (Fig. 1A). Weight loss during A/WSN/33 infection correlated with the amount of vascular leakage and tissue damage observed in the lungs of A/WSN/33 infected mice, as measured by total protein (Fig. 1B) or lactate dehydrogenase (data not shown) levels present in the BALF. Moreover, B6.Cg-KitW-sh mice infected with A/WSN/33 had reduced numbers of inflammatory cells infiltrating into the BALF 7 d postinfection (Fig. 1C). The reduced BALF cell numbers in the B6.Cg-KitW-sh mice were observed in all cell populations (macrophages, neutrophils, and lymphocytes). Reduced inflammatory cells infiltrating the BALF was not due to significantly decreased cell numbers found in the BALF of naive B6.Cg-KitW-sh mice (C57BL/6, 1.00 × 105 ± 0.48 × 105 versus B6.Cg-KitW-sh, 0.77 × 105 ± 0.54 × 105, p = 0.29) or BALF composition, which was >90% alveolar macrophages in both naive C57BL/6 and B6.Cg-KitW-sh mice (data not shown). Moreover, leukocyte numbers are largely normal in B6.Cg-KitW-sh mice; if anything, those mice display neutrophilia (33). Histological analysis of lungs from A/WSN/33-infected C57BL/6 mice display robust interstitial inflammatory infiltrates on both day 7 and 10 postinfection; additionally, by day 10, airway infiltration was seen by histology in the infected C57BL/6 mice (Fig. 1E). In contrast, B6.Cg-KitW-sh mice display minimal interstitial inflammatory infiltrates at either time point. These data track with the amount of IAV-induced immunopathology observed, as measured by protein in the BALF (Fig. 1B). The reduction in IAV-induced immunopathology in B6.Cg-KitW-sh mice was not the result of decreased viral growth in the respiratory tract, because viral titers were similar after A/WSN/33 infection in C57BL/6 and B6.Cg-KitW-sh mice, and both mouse strains cleared the IAV infection by 10 d postinfection (Fig. 1D). B6.Cg-KitW-sh is less sensitive to A/WSN/33. Age-matched C57BL/6 (B6) or B6.Cg-KitW-sh (Wsh) mice were infected nasally with 1500 PFU of A/WSN/33. (A) Body weights were measured daily. The data are normalized to each mouse’s starting body weight. (B) Damage to the lung was assessed by measuring the total protein levels in the BALF at the indicated time points. (C) Total leukocyte recruitment to the BALF was measured on day 7 postinfection. (D) Lung viral titers were determined at the indicated time points postinfection by plaque assay on MDCK cells. Dashed line represents the limit of detection of the plaque assay (2 PFU/ml). (E) Formalin-fixed lungs were paraffin embedded and then sectioned and stained with H&E for analysis by microscopy. Representative lung sections from naive and A/WSN/33-infected (7 or 10 d) C57BL/6 and Wsh mice are shown. Scale bars, 100 μm. Data are representative of two to four independent experiments consisting of four to eight mice/group. *p < 0.05, Mann–Whitney U test. N.D., None detected. It seems that mice devoid of mast cells are highly resistant to IAV-induced inflammatory disease (Fig. 1). However, B6.Cg-KitW-sh mice have abnormalities in addition to the mast cell deficiency (26, 33). To ensure that the defect in the B6.Cg-KitW-sh mice was within the mast cell compartment, we created mast cell knock-in mice, as described (26–28). Selective reconstitution of the mast cell compartment of B6.Cg-KitW-sh mice with 5 × 106 C57BL/6-derived BMCMCs 8–10 wk prior to IAV infection was able to complement the reduced weight loss and inflammatory cell recruitment observed in B6.Cg-KitW-sh mice (Fig. 2). Thus, our data demonstrate that, during respiratory infection with IAV, mast cells are crucial participants in the pathological innate immune response. B6.Cg-KitW-sh mice reconstituted with BMCMCs were susceptible to A/WSN/33. (A) Age-matched C57BL/6 (B6), B6.Cg-KitW-sh (Wsh), or B6.Cg-KitW-sh mice reconstituted with 3 × 106 BMCMCs 10 wk prior were infected nasally with 1500 PFU of A/WSN/33. Body weights were measured daily. The data are normalized to each mouse’s starting body weight. (B) Age-matched C57BL/6 mice and B6.Cg-KitW-sh mice, reconstituted with either 1 × 106 or 5 × 106 BMCMCs, were infected nasally 10 wk later with 1500 PFU of A/WSN/33, and total lymphocyte, neutrophil, and macrophage count in the BALF was measured 7 d postinfection. Data are representative of two independent experiments consisting of four to eight mice/group. Statistically significant differences were determined using a Mann–Whitney U test (A) or one-way ANOVA (B). †Mouse had to be euthanized. *p < 0.05. Because our data demonstrated a dramatic reduction in the number of inflammatory cells infiltrating into the BALF of B6.Cg-KitW-sh mice (Figs. 1, 2), we next wanted to assess the inflammatory cytokine- and chemokine-production pattern in C57BL/6 and B6.Cg-KitW-sh mice after A/WSN/33 infection. To do this, C57BL/6 and B6.Cg-KitW-sh mice were infected with 1500 PFU of A/WSN/33. BALF was collected from individual mice 7 d after A/WSN/33 infection and analyzed by Multiplex bead–based assays. We found that there was a marked alteration of the inflammatory milieu in the BALF of B6.Cg-KitW-sh mice after A/WSN/33 infection compared with C57BL/6 mice. Specifically, there was a reduction in TNF-α, CCL2, CCL3, CCL4, CXCL2, and CXCL10 at this time point in the B6.Cg-KitW-sh mice (Fig. 3, data not shown). Moreover, there was a trend toward reduced levels of IL-6 and IFN-γ (Fig. 3, data not shown). However, not all cytokine expression was lost in B6.Cg-KitW-sh mice, because there was equivalent expression of CCL5, CCL12, IL-5, IL-16, LIF, G-CSF, and CX3CL1 (Fig. 3, data not shown). All cytokine and chemokines were below the limit of detection in naive BALF from C57BL/6 mice, with the exception of IL-16 (36.9 ± 5.9 pg/ml) and CX3CL1 (140.6 ± 79.3 pg/ml). Thus, our data suggest that mast cells can be important for initiating the inflammatory milieu found during IAV infection. B6.Cg-KitW-sh mice had lower levels of cytokines in the lung during A/WSN/33 infection. Age-matched C57BL/6 (B6) or B6.Cg-KitW-sh (Wsh) mice were infected nasally with 1500 PFU of A/WSN/33. Cytokine and chemokine levels in the BALF were assessed 7 d postinfection using Milliplex multiplex assays. Data are representative of two independent experiments with four to six mice/group. *p < 0.05, Mann–Whitney U test. Next, we wanted to assess whether IAV had the potential to directly activate mast cells in vitro. To do this, 2.5 × 105 BMCMCs were treated with medium or A/WSN/33 for 6 h or at the indicated times. BMCMC supernatants were then analyzed for mast cell mediators, which included histamine, LTB4, and cytokines. Medium-treated BMCMCs showed minimal expression of all three mediators (Fig. 4). Additionally, uninfected allantoic fluid did not cause greater mast cell mediator release than medium alone (Supplemental Fig. 1). A/WSN/33 treatment of BMCMCs resulted in histamine release, CCL2 secretion, and LTB4 production (Fig. 4). Specifically, we found that mast cells released histamine in two waves: the first peaking ∼30 min after A/WSN/33 treatment and the second beginning ∼4 h after stimulation (Fig. 4A). Additionally, 6 h after A/WSN/33 inoculation, mast cells produced substantial quantities of CCL2 (Fig. 4B) and LTB4 (Fig. 4C). In a broader analysis of the cytokines and chemokines secreted by BMCMCs after A/WSN/33 activation, we found that mast cells produced CCL2, CCL3, CCL4, CCL5, CXCL2, CXCL9, CXCL10, IL-6, and TNF-α, but not CXCL1, IFN-α, IFN-β, IFN-γ, IL-1β, IL-5, IL-9, IL-15, or VEGF, in response to A/WSN/33 (Supplemental Table I). Furthermore, cytokine and chemokine expression began ∼2 h after IAV treatment (data not shown). Thus, at least in vitro, IAV-induced mast cell activation appears to occur through direct recognition of the virus. In vitro BMCMC activation with A/WSN/33 results in mast cell activation. BMCMCs were derived by culturing total bone marrow with IL-3 for 5 wk and supplementing with stem cell factor for the last 2 wk. A total of 2.5 × 105 FcRε1+ and CD117+ mast cells was treated with media, A/WSN/33 (WSN), or a positive control of calcium ionophore (Ca2+; 40 nM) or LPS (5 μg/ml). (A) Histamine levels were measured by EIA at the indicate time points. As a control, histamine levels from unstimulated BMCMCs were assayed after 6 h of culture. Cytokine/chemokine (B) and LTB4 (C) secretion was measured 6 h after stimulation by either Milliplex multiplex analysis or EIA, respectively. Each virus was added at an MOI of 1. Data are representative of two to four independent experiments. n.d., None detected. Because A/WSN/33 is a highly mouse-adapted strain of IAV, we next wanted to assess whether human-derived isolates that had not been passed through mice could activate mast cells in vitro. To do this, 2.5 × 105 BMCMCs were treated with 50 μl of each influenza virus isolate for 6 h. BMCMC supernatants were then analyzed for the cytokine and chemokine levels. In agreement with our earlier findings, A/WSN/33 treatment of BMCMCs resulted in secretion of IL-6, CCL2, and TNF-α (Fig. 5, black bars and data not shown). Interestingly, another mouse-adapted IAV strain, A/Puerto Rico/8/34, resulted in minimal activation of mast cells (Fig. 5), which corresponds with our in vivo observation that B6.Cg-KitW-sh mice are as susceptible as C57BL/6 mice to A/PR/8/34 infection (data not shown). 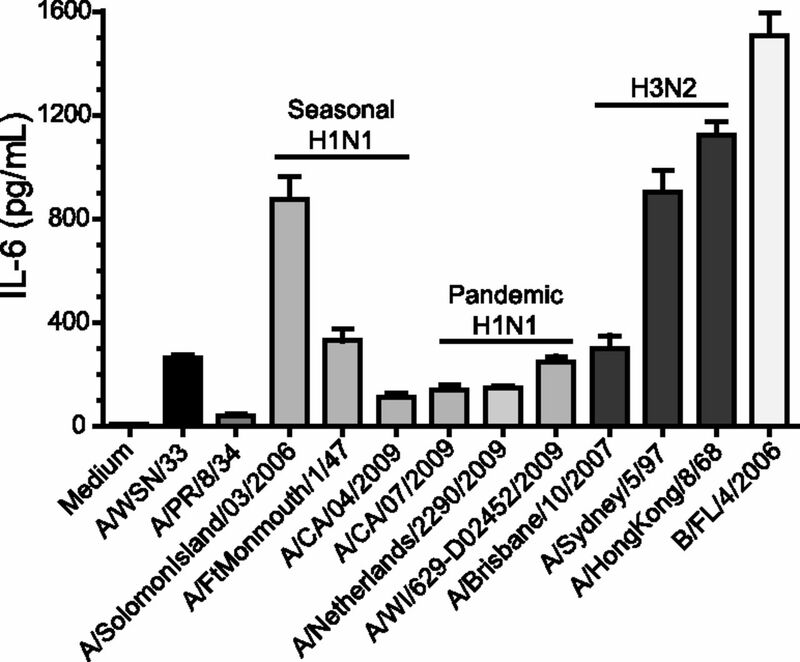 Human-derived IAV isolates of both H1N1 (Fig. 5, light gray bars) and H3N2 (Fig. 5, dark gray bars) families activated murine BMCMCs to produce cytokines and chemokines to varying levels. Furthermore, the influenza B virus isolate B/Florida/4/2006 also activated murine BMCMCs in vitro to produce these cytokines and chemokines (Fig. 5, white bars). Our data support the notion that mast cells could play an important role in the inflammatory response to a range of influenza virus isolates. Human influenza virus isolates can activate mast cells. BMCMCs were derived by culturing total bone marrow with IL-3 for 5 wk and supplementing with stem cell factor for the last 2 wk. A total of 2.5 × 105 FcRε1+ and CD117+ mast cells was treated with media or 50 μl of each virus for 6 h, at which time supernatants were collected and analyzed for cytokine and chemokine analysis with Milliplex multiplex analysis. Expression of IL-6 is shown for each virus. Mouse-adapted strains of IAV H1N1: A/WSN/33 and A/PR/8/34 (egg-infectious dose (EID)50/ml log10 = 8.8); human-derived isolates of IAV H1N1 which are either seasonal or pandemic viruses: A/Solomon Island/03/2006 (EID50/ml log10 = 7.2), A/FtMonmouth/1/47 (EID50/ml log10 = 7.4), A/CA/04/2009 (EID50/ml log10 = 6.9), A/CA/07/2009 (EID50/ml log10 = 8.4), A/Netherlands/2290/2009 (EID50/ml log10 = 7.4), and A/WI/629-D02452/2009 (EID50/ml log10 = 7.2); human-derived isolates of IAV H3N2: A/Brisbane/10/2007 (EID50/ml log10 = 8.4), A/Sydney/5/97 (EID50/ml log10 = 7.9), and A/Hong Kong/8/68 (EID50/ml log10 = 8.4); and human-derived isolates of influenza B virus B/FL/4/2006 (EID50/ml log10 = 8.4). Similar results were observed with CCL2 and CCL4 (data not shown). Data are representative of two independent experiments. All IAV isolates, with the exception of A/PR/8/34, induced an IL-6 response that was statistically significantly different from the medium control, as determined by one-way ANOVA (p < 0.05). We next wanted to determine whether mast cells were capable of being infected with IAV. To do this, 2.5 × 105 BMCMCs were treated with medium, A/PR/8/34, or A/WSN/33 for 6 h. Cells were then fixed, permeabilized, and stained for intracellular NS1 of IAV. NS1 is a nonstructural protein that is not found in the IAV virion and, therefore, requires de novo synthesis of viral proteins to detect protein. 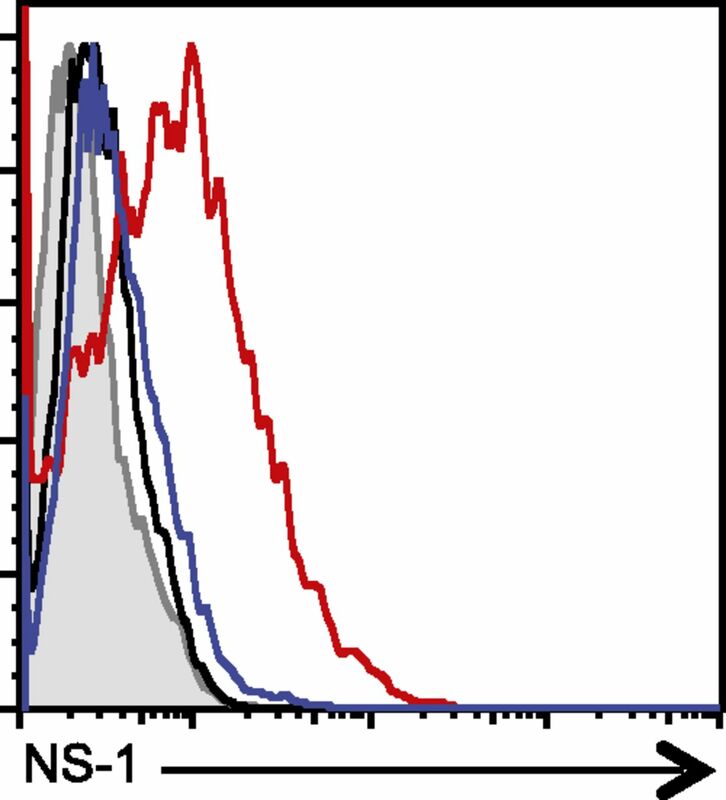 Uninfected BMCMCs displayed minimal anti-NS1 staining over our secondary Ab alone (Fig. 6, black graph). Interestingly, A/WSN/33-treated BMCMCs expressed intracellular NS1 (Fig. 6, red graph), whereas A/PR/8/34-treated BMCMCs did not (Fig. 6, blue graph). However, we could not detect de novo production of infectious IAV virions over a 72-h time period by BMCMCs (data not shown). Thus, the A/WSN/33 strain of IAV is able to directly infect mast cells, which correlates with the virus’ ability to activate mast cells, but it could not propagate IAV. Mast cells are infected by A/WSN/33. BMCMCs were derived by culturing total bone marrow with IL-3 for 5 wk and supplementing with stem cell factor for the last 2 wk. A total of 2.5 × 105 FcRε1+ and CD117+ mast cells was treated with medium, A/WSN/33, or A/PR/8/34. Each virus was added at an MOI of 1. BMCMCs were harvested after 5 h and fixed, permeabilized, and stained for intracellular NS-1 using mAb NS1-1A7 for 30 min. BMCMCs were then stained with PE-labeled anti-mouse IgG F(ab′)2 fragments. Representative graphs are shown for two independent experiments. Shaded graph = PE-labeled anti-mouse IgG F(ab′)2 fragments alone; black graph = media-treated BMCMCs; blue graph = A/PR/8/34-infected BMCMCs; red graph = A/WSN/33-infected BMCMCs. Numerous pattern recognition receptors were shown to play a role in sensing IAV infection. These include the TLR3, TLR7, NLRP3, and RIG-I receptors (34–43). Because BMCMCs were productively infected with A/WSN/33, we hypothesized that detection of cytosolic genomic RNA might be crucial for mast cell activation. The major cytosolic receptor for IAV RNA is RIG-I, which subsequently docks on its adaptor MAVS (also known as IPS-1, VISA, and Cardif) to initiate IRF3- and NF-κB–dependent signaling (44–47). We first decided to examine the role of RIG-I in the activation of mast cells by A/WSN/33. To do this, 2.5 × 105 BMCMCs from either C57BL/6 or RIG-I−/− mice were treated with medium, A/WSN/33, or LPS for 6 h. In agreement with our previous findings, A/WSN/33 treatment of C57BL/6-derived BMCMCs resulted in significant production of histamine, IL-6, and LTB4 (Fig. 7). In contrast, RIG-I−/−-derived BMCMCs had significantly blunted IL-6 and LTB4 responses after A/WSN/33 treatment (Fig. 7A, 7B). However, RIG-I−/−-derived BMCMCs produced equivalent levels of histamine compared with A/WSN/33-treated C57BL/6-derived BMCMCs (Fig. 7C). Similarly, when BMCMCs from MAVS−/− mice were used, cytokine and chemokine production was significantly reduced, whereas histamine release was normal (data not shown). Importantly, RIG-I−/− BMCMCs responded similarly to C57BL/6 BMCMCs to an irrelevant stimulus, such as LPS or A23187 (data not shown). Our data demonstrate that RIG-I/MAVS signaling is crucial for de novo–generated mediators but not the immediate degranulation response of mast cells during IAV treatment. Mast cell activation by A/WSN/33 is dependent on RIG-I. BMCMCs were generated by culturing total bone marrow from either C57BL/6 (B6) or RIG-I−/− mice with IL-3 for 5 wk and supplementing with stem cell factor for the last 2 wk. A total of 2.5 × 105 FcRε1+ and CD117+ mast cells was treated with media or A/WSN/33 (WSN). Virus was added at an MOI of 1. Six hours after inoculation, histamine (A), IL-6 (B), and LTB4 (C) levels were measured by Milliplex multiplex analysis or EIA. Similar data were observed for CCL2 and CCL4 expression (data not shown). Data are representative of two to four independent experiments. *p < 0.05, ***p < 0.001, one-way ANOVA. Our knowledge about the signaling networks downstream of RIG-I recognition of ssRNA has expanded to include STING, CARD9, and STAT6. RIG-I/MAVS interactions result in the activation of IRF3 and NF-κB (44–47). Recently, CARD9 and MALT10 were shown to be necessary for activation of NF-κB, but not IRF3, in response to synthetic RIG-I ligands or vesicular stomatitis virus (VSV) infection (48). STING is an endoplasmic reticulum–resident protein that was shown to be important in the RIG-I–dependent antiviral response to VSV (49). Additionally, other investigators found that STAT6 is recruited to the STING–MAVS–RIG-I complex during Sendai virus or VSV infection to mediate CCL2 and CCL20 expression, but it is dispensable for IL-6 production (50). Because RIG-I and MAVS were critical in the cytokine/chemokine response of BMCMCs, we next wanted to examine the role of CARD9, STING, and STAT6 in the response of BMCMCs to A/WSN/33 infection. To do this, 2.5 × 105 BMCMCs from C57BL/6, CARD9−/−, STING−/−, or STAT6−/− mice were treated with medium, A/WSN/33, or LPS for 6 h. In agreement with our previous findings, A/WSN/33 treatment of C57BL/6-derived BMCMCs resulted in cytokine and chemokine secretion in all experiments (Fig. 8). The response of CARD9−/−-derived BMCMCs was similar to C57BL/6-derived BMCMCs after A/WSN/33 infection (Fig. 8A). However, STING−/−- and STAT6−/−-derived BMCMCs had an ∼50% reduction in their production of IL-6, CCL2, and CCL4 (Fig. 8B, 8C, data not shown). Importantly, CARD9−/−, STING−/−, and STAT6−/− BMCMCs responded similarly to C57BL/6 BMCMCs to an irrelevant stimulus, such as LPS (data not shown). Thus, although RIG-I and MAVS are absolutely essential for the cytokine response of BMCMCs in response to IAV infection (Fig. 7), CARD9 is completely dispensable, whereas STING and STAT6 play partial roles in the inflammatory cytokine and chemokine response to IAV infection (Fig. 8). Mast cell activation is partially dependent on STING and STAT6. BMCMCs were generated by culturing total bone marrow from either C57BL/6 (B6) or CARD9−/− mice (A), C57BL/6 or STAT6−/− mice (B), or C57BL/6 or STING−/− mice (C) or with IL-3 for 5 wk and supplemented with stem cell factor for the last 2 wk. A total of 2.5 × 105 FcRε1+ and CD117+ mast cells was treated with media or A/WSN/33 (WSN). Virus was added at an MOI of 1. Six hours after inoculation, IL-6 levels were measured by Milliplex multiplex analysis. Similar data were observed for CCL2 and CCL4 expression (data not shown). Data are representative of two to four independent experiments. **p < 0.01, ***p < 0.001, one-way ANOVA. Mast cells are tissue-resident hematopoietic cells. Because infectious agents enter the host through environmentally exposed barriers, such as the skin, gastrointestinal tract, and respiratory tract, mast cells are poised to be one of the first cell types to respond to invading pathogens. Furthermore, mast cells express a wide array of pattern recognition receptors that endow them with the ability to respond to a broad range of stimuli, such as infections and pathogenic conditions (51). It is well established that mast cells play crucial immune surveillance roles during bacterial and parasitic infections (8, 12). In contrast, the role of mast cells in the immune surveillance of viral infections has received less attention. In the current study, we examined the role of mast cells in sensing IAV infection and initiating the subsequent inflammatory response. A primary rationale for our work stems from the recent work by Teijaro et al. (6), who demonstrated that blunting the cytokine storm significantly improves the health of animals infected with either the mouse-adapted IAV strain A/WSN/33 or the 2009 H1N1pdm strain A/Wisconsin/WSLH34939/2009. Thus, we reasoned that if mast cells are critical mediators of the inflammatory response to IAV, a further understanding of this interaction may lead to new therapeutic option(s) to improve IAV patient outcomes. In further support of our hypothesis regarding mast cells and IAV, recent genetic analysis of the lungs from mice infected with a model strain of the 2009 IAV pandemic virus demonstrated an enrichment of genes associated with mast cells (32). However, whether respiratory mast cells play a role during IAV infection remains elusive. Our data demonstrate that mast cells are critical participants in local lung inflammation and systemic IAV–induced disease during A/WSN/33 infection of mice. In vivo, we found that mast cells contributed to the establishment of the inflammatory milieu and lung damage during A/WSN/33 infection. This does not seem to be due to dramatic differences in the lung viral burden in the absence of mast cells; rather, in the absence of mast cells (B6.Cg-KitW-sh), mice had decreased inflammatory cell infiltration into the BALF and levels of inflammatory cytokines and chemokines. Importantly, this reduction in inflammatory cells and mediators in the absence of mast cells correlated with reduced lung damage and/or vascular leakage, as measured by protein levels in the BALF. Our results fit with a recent report that the H5N1 isolate A/chicken/Henan/1/2004 was capable of activating the mastocytoma cell line P815 and inducing a significant increase in mast cell numbers within the respiratory tract over the first 5 d of IAV infection in mice (52). We extend these findings to show that IAV can activate primary mast cells (BMCMCs) and, importantly, that H1N1, H3N2, and influenza B viruses could also activate mast cells. Additionally, Hu et al. (52) demonstrated that ketotifen, an H1 receptor inhibitor (53), could limit epithelial cell death in vivo. However, ketotifen can also inhibit cytokine and chemokine expression by macrophages after LPS stimulation (54), and the H1 receptor has a broad expression pattern, including airway epithelial cells (55). These facts complicate the interpretation by Hu et al. (52) that mast cells are the crucial cell inhibited by ketotifen. In our study, we specifically demonstrate that mice lacking mast cells do not develop as severe an IAV-induced inflammatory response and lung damage, which could be complemented by reconstitution of those mice with mast cells. How mast cells mediate their response in vivo is the focus of our future studies. In vitro, Hu et al. (52) demonstrated that mast cells produced high levels of IFN-γ, which caused significant epithelial cell death. However, we failed to detect any IFN-γ expression by BMCMCs after IAV treatment. The major differences between our two studies are the source of mast cells (primary BMCMCs versus P815 cell line) and viral isolates studied (H1N1 versus H5N1 isolates), which likely could contribute to this difference. However, both our study and that of Hu et al. (52) suggest that human IAV isolates can activate mast cells. Interestingly, IAV infection of humans results in elevated urinary histamine levels, whose major source in vivo are mast cells and basophils (56), which peaked ∼2 d postinfection, and its expression correlated with virus-induced illness (57). Thus, mast cells seem to be an attractive target for a host-targeted therapeutic to limit the pathological response induced by IAV infection. Interestingly, similar to our results with IAV, mast cells were shown to play a key role during cutaneous viral infections. Cutaneous mast cells were recently shown to play a protective role during skin vaccinia virus infection (22). Additionally, mast cells were shown to be crucial for the in vivo immune surveillance of dengue virus after a footpad inoculation (19). Mast cells can also regulate endothelial cell function during dengue virus infection in vitro (58). Importantly, dengue shock syndrome in humans includes elevated levels of mast cell–derived tryptases and chymases (21). Thus, mast cells are likely to be crucial participants in the inflammatory response during dengue virus infection through the skin. These data, together with ours, demonstrate that mast cells may play a crucial role in the immune surveillance of viral infections in general. A major question is how mast cells detect viral infections and whether mast cells can serve as a suitable environment for virus replication. Again, there seems to be numerous correlations between IAV and dengue virus. We found that mast cells were directly infected with IAV in vitro, as demonstrated by de novo NS1 expression, but BMCMCs could not propagate A/WSN/33 in vitro. This fits with the recent findings of Befus and colleagues (59) that IAV did not replicate in human mast cells. Similarly, the mast cells could be infected with dengue virus (19, 20); however, in contrast to our results, dengue virus could replicate within mast cells (19). BMCMCs could be infected with vaccinia virus at higher MOIs, but whether vaccinia virus could replicate within mast cells in vitro was not explored (22). Interestingly, it appears that each phase of the mast cell response, immediate degranulation and de novo mediator synthesis, is regulated by a distinct innate immune–sensing receptor and signaling network during the course of IAV infection. Expression of de novo–synthesized cytokines and chemokines following IAV inoculation required RIG-I and MAVS. Similar to our results with IAV, chemokine expression by mast cells in response to dengue virus infection was dependent on sensing by both of the cytosolic RNA sensors: RIG-I and Mda5 (19, 20). Moreover, IL-6, CXCL10, and type I IFN expression by BMCMCs in response to VSV treatment was dependent on RIG-I and Mda5 (60). Upon interacting with RNA, RIG-I and Mda5 undergo a conformational change, allowing them to bind with the scaffolding protein MAVS. Originally, MAVS was described as a mitochondrial-localized protein (44), but it was recently found to localize to the peroxisome, as well (61). Interestingly, the downstream-signaling events of mitochondrial- or peroxisome-localized RIG-I/MAVS complexes differ (61). Specifically, peroxisome-localized RIG-I/MAVS results in the activation of early IFN-regulated proteins in the absence IFN-α/β expression (61). In contrast, mitochondrial-localized RIG-I/MAVS results in the production of IFN-α/β with delayed kinetics (61). RIG-I seems to interact with MAVS at the mitochondria-associated endoplasmic reticulum membrane (62). STING is an endoplasmic reticulum protein that is important for the scaffolding protein for signaling of receptors detecting cytosolic nucleic acids (49). STING–RIG-I interactions were recently demonstrated to be important for the antiviral response to Japanese encephalitis virus (63). Moreover, STING recruits Stat6-dependent antiviral immunity through the production of CCL2, CCL20, and CCL26 but not IL-6 and IFN-α/β (50). Our data are consistent with a more central role for peroxisome-mediated RIG-I/MAVS–mediated signaling during IAV infection of BMCMCs for two reasons: we observed nominal expression of IFN-α/β, CXCL9, and CXCL10, and we observed only a partial STING and Stat6 dependency for the inflammatory response of BMCMCs. However, formal testing of whether peroxisome or mitochondrial MAVS is more important during IAV infection of mast cells remains to be explored. Additionally, the PB1-F2 protein of IAV was shown to interfere with MAVS-mediated signaling through disruption of the mitochondrial membrane potential (64–66). Potentially, PB1-F2’s expression in mast cells could strongly impair mitochondria-localized MAVS, making peroxisome-localized MAVS the dominant signaling pathway in mast cells. Thus, it will be intriguing to test the antiviral cellular response of BMCMCs in the absence of these IAV proteins. In addition to viral-detection mechanisms, how mast cells degranulate in response to IAV, VSV, or dengue virus infection remains an open question. Histamine production by BMCMCs occurred rapidly after IAV inoculation and seems to occur prior to endosomal escape of the virus (data not shown). Furthermore, histamine production by BMCMCs after IAV infection was normal in the absence of RIG-I. Analogously, BMCMC degranulation in response to VSV treatment occurred normally following RIG-I or Mda5 knockdown by small interfering RNA (60). Other pattern recognition receptors detecting early stages of the IAV infectious cycle could be important, such as TLR3 or TLR7 (34–36). However, triggering of synthetic polyinosinic-polycytidylic acid could not induce the degranulation of human mast cells (67). Alternatively, STING was recently shown to “recognize” viral membrane fusion (68), but its role in mast cell degranulation has not been explored. Vaccinia virus infection is the only viral infection for which we have at least a partial understanding of how it induces mast cell degranulation. During vaccinia virus infection, BMCMC degranulation occurred in a membrane fusion-dependent and S1PR2-dependent manner (22). S1P signaling is important for inducing the cytokine storm during IAV infection (6) and, in vitro it can regulate IAV growth (69); however, whether S1P signaling plays a role in regulating mast cell function during IAV infection remains unknown. In conclusion, we demonstrate that mast cells can be infected by IAV, resulting in their activation. Importantly, mast cells were critical participants in IAV-induced cytokine storm and systemic disease during A/WSN/33 infection of mice. Our results suggest that the mast cell response to IAV infection is regulated by multiple receptors controlling either degranulation or de novo mediator synthesis. Based on our findings, it is important to consider the role that mast cells play in regulating the excessive inflammatory response during infections. It remains to be answered whether degranulation, de novo mediator synthesis, or both are required for mast cells to enhance the inflammatory response and pathology during IAV infection. Understanding these events is imperative for developing a host-targeted therapeutic that is aimed at curtailing mast cell function to limit IAV-induced morbidity and mortality. We thank all of the investigators who provided knockout mice and/or bone marrow for the in vitro BMCMC-activation studies: Dr. Michael Gale, Dr. Matthias Schnell, Dr. John Cambier, Dr. Tobias Hohl, and Dr. Daniel Campbell. We also thank Dr. David Topham for providing the initial A/WSN/33 viral stock. Dr. Leo Lefrançois (University of Connecticut Health Center, Farmington, CT), Dr. Jonathan Yewdell (National Institutes of Health/National Institute of Allergy and Infectious Diseases), Dr. Allen Harmsen (Montana State University), and Dr. Robert Cramer (Geisel School of Medicine at Dartmouth, Hanover, NH) provided many helpful suggestions about this project. A.C.G. and J.J.O. conceived and designed the experiments, performed the experiments, analyzed the data, and wrote the manuscript; and K.M.H. and J.M.Z. performed the experiments and analyzed the data. This work was supported by National Institutes of Health Grants P20 RR-020185, P20 GM-103500, and K22 AI-091647 (all to J.J.O. ); the Montana State University Agricultural Experimental Station; and an equipment grant from the M.J. Murdock Charitable Trust.
. 2008. The pathology of influenza virus infections. Annu. Rev. Pathol. 3: 499–522.
. 2009. Early and sustained innate immune response defines pathology and death in nonhuman primates infected by highly pathogenic influenza virus. Proc. Natl. Acad. Sci. USA 106: 3455–3460.
. 2008. 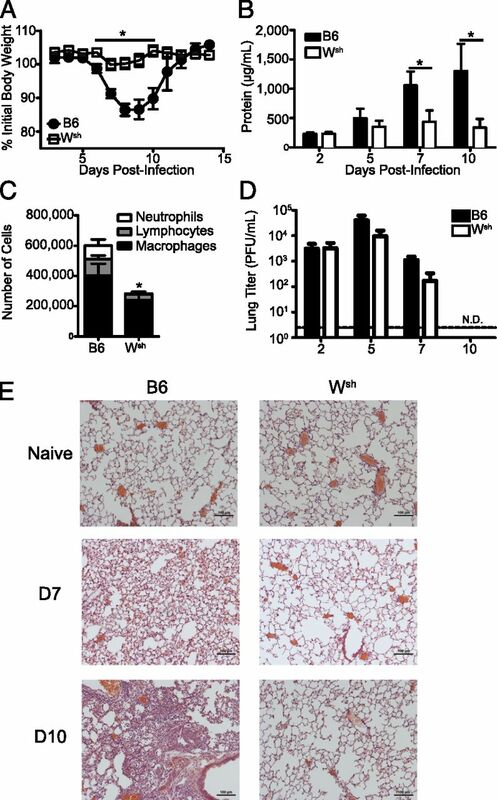 H5N1 and 1918 pandemic influenza virus infection results in early and excessive infiltration of macrophages and neutrophils in the lungs of mice. PLoS Pathog. 4: e1000115.
. 2006. Genomic analysis of increased host immune and cell death responses induced by 1918 influenza virus. Nature 443: 578–581.
. 2006. Integrated molecular signature of disease: analysis of influenza virus-infected macaques through functional genomics and proteomics. J. Virol. 80: 10813–10828.
. 2011. Endothelial cells are central orchestrators of cytokine amplification during influenza virus infection. Cell 146: 980–991.
. 2011. Mast cells in lung inflammation. Adv. Exp. Med. Biol. 716: 235–269.
. 2011. The mast cell in innate and adaptive immunity. Adv. Exp. Med. Biol. 716: 162–185.
. 2010. Infection of in vivo differentiated human mast cells with hantaviruses. J. Gen. Virol. 91: 1256–1261.
. 2002. Dengue virus selectively induces human mast cell chemokine production. J. Virol. 76: 8408–8419. 1977. 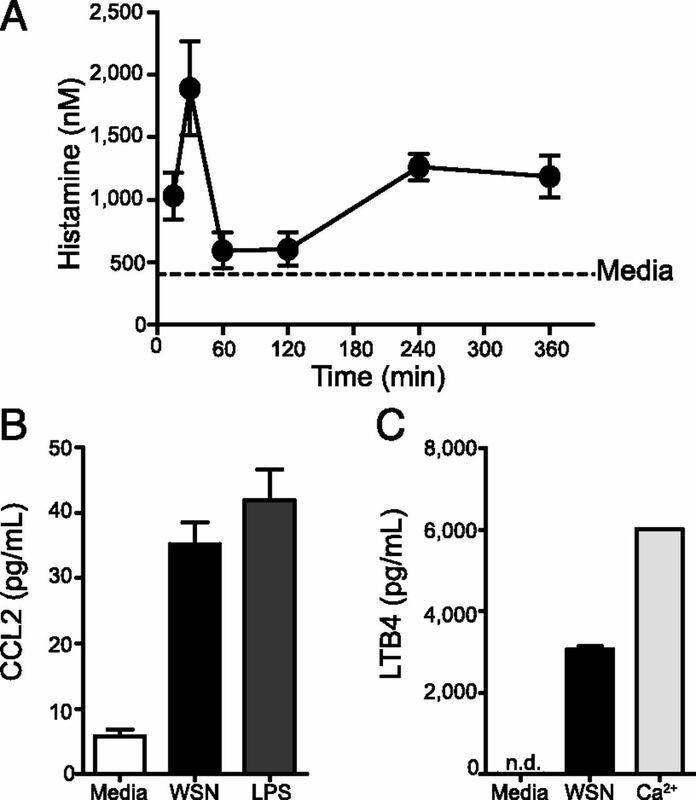 Histamine release from rat mast cells induced by Sendai virus. Nature 270: 614–615.
. 2008. Human mast cell activation with virus-associated stimuli leads to the selective chemotaxis of natural killer cells by a CXCL8-dependent mechanism. Blood 111: 5467–5476.
. 2012. RNA sensors enable human mast cell anti-viral chemokine production and IFN-mediated protection in response to antibody-enhanced dengue virus infection. PLoS ONE 7: e34055. Furuta, T., L. A. Murao, N. T. Lan, N. T. Huy, V. T. Huong, T. T. Thuy, V. D. Tham, C. T. Nga, T. T. Ha, Y. Ohmoto, et al. 2012. Association of mast cell-derived VEGF and proteases in Dengue shock syndrome. PLoS Negl. Trop. Dis. 6: e1505.
. 1988. Influenza A virus potentiates basophil histamine release caused by endotoxin-induced complement activation. Examination of normal individuals and patients with intrinsic asthma. Allergy 43: 93–99.
. 2002. Infection with influenza a virus leads to flu antigen-induced cutaneous anaphylaxis in mice. J. Invest. Dermatol. 118: 645–651.
. 2011. Mast cells condition dendritic cells to mediate allograft tolerance. Immunity 35: 550–561.
. 1985. Fate of bone marrow-derived cultured mast cells after intracutaneous, intraperitoneal, and intravenous transfer into genetically mast cell-deficient W/Wv mice. Evidence that cultured mast cells can give rise to both connective tissue type and mucosal mast cells. J. Exp. Med. 162: 1025–1043.
. 2005. Using mast cell knock-in mice to analyze the roles of mast cells in allergic responses in vivo. Chem. Immunol. Allergy 87: 179–197.
. 2011. Mast cell/IL-4 control of Francisella tularensis replication and host cell death is associated with increased ATP production and phagosomal acidification. Mucosal Immunol. 4: 217–226.
. 2008. Mast cells inhibit intramacrophage Francisella tularensis replication via contact and secreted products including IL-4. Proc. Natl. Acad. Sci. USA 105: 9313–9318.
. 2006. 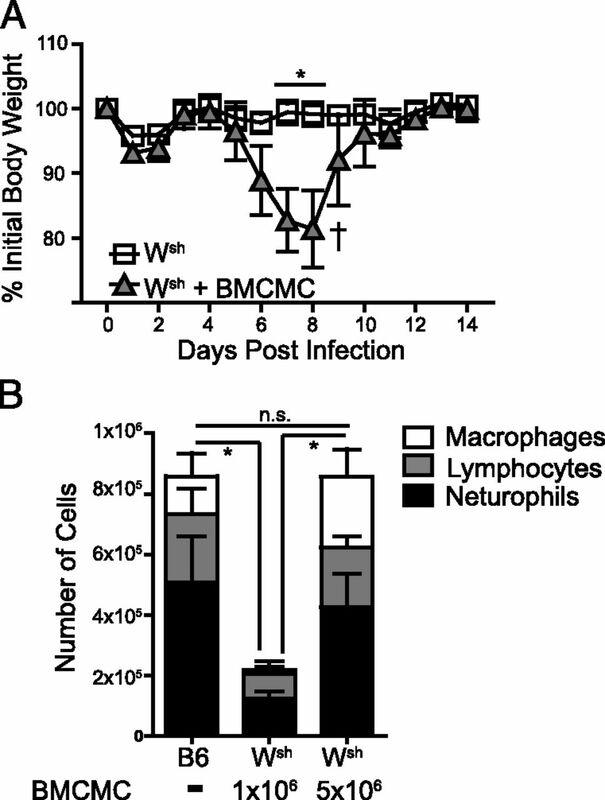 Mast cells protect mice from Mycoplasma pneumonia. Am. J. Respir. Crit. Care Med. 173: 219–225.
. 2012. Implication of inflammatory macrophages, nuclear receptors, and interferon regulatory factors in increased virulence of pandemic 2009 H1N1 influenza A virus after host adaptation. J. Virol. 86: 7192–7206.
. 2008. Genetic inversion in mast cell-deficient (Wsh) mice interrupts corin and manifests as hematopoietic and cardiac aberrancy. Am. J. Pathol. 173: 1693–1701.
. 2007. Cutting Edge: Influenza A virus activates TLR3-dependent inflammatory and RIG-I-dependent antiviral responses in human lung epithelial cells. J. Immunol. 178: 3368–3372.
. 2010. Influenza virus activates inflammasomes via its intracellular M2 ion channel. Nat. Immunol. 11: 404–410.
. 2009. The NLRP3 inflammasome mediates in vivo innate immunity to influenza A virus through recognition of viral RNA. Immunity 30: 556–565.
. 2009. Inflammasome recognition of influenza virus is essential for adaptive immune responses. J. Exp. Med. 206: 79–87.
. 2006. RIG-I-mediated antiviral responses to single-stranded RNA bearing 5′-phosphates. Science 314: 997–1001.
. 2006. Differential roles of MDA5 and RIG-I helicases in the recognition of RNA viruses. Nature 441: 101–105.
. 2005. Identification and characterization of MAVS, a mitochondrial antiviral signaling protein that activates NF-kappaB and IRF 3. Cell 122: 669–682.
. 2005. IPS-1, an adaptor triggering RIG-I- and Mda5-mediated type I interferon induction. Nat. Immunol. 6: 981–988.
. 2005. VISA is an adapter protein required for virus-triggered IFN-beta signaling. Mol. Cell 19: 727–740.
. 2005. Cardif is an adaptor protein in the RIG-I antiviral pathway and is targeted by hepatitis C virus. Nature 437: 1167–1172.
. 2010. Recognition of RNA virus by RIG-I results in activation of CARD9 and inflammasome signaling for interleukin 1 beta production. Nat. Immunol. 11: 63–69.
. 2008. STING is an endoplasmic reticulum adaptor that facilitates innate immune signalling. Nature 455: 674–678.
. 2008. Mast cells: multifaceted immune cells with diverse roles in health and disease. Ann. N. Y. Acad. Sci. 1143: 83–104.
. 2012. Mast cell-induced lung injury in mice infected with H5N1 influenza virus. J. Virol. 86: 3347–3356.
. 1990. Ketotifen. A review of its pharmacodynamic and pharmacokinetic properties, and therapeutic use in asthma and allergic disorders. Drugs 40: 412–448.
. 2007. Suppressive effects of ketotifen on Th1- and Th2-related chemokines of monocytes. Pediatr. Allergy Immunol. 18: 378–384.
. 1997. International Union of Pharmacology. XIII. Classification of histamine receptors. Pharmacol. Rev. 49: 253–278.
. 2001. Urinary histamine metabolite elevations during experimental influenza infection. Ann. Allergy Asthma Immunol. 87: 303–306.
. 2011. Dengue virus infection of mast cells triggers endothelial cell activation. J. Virol. 85: 1145–1150.
. 2012. Limited replication of influenza A virus in human mast cells. Immunol. Res. DOI: 10.1007/s12026-012-8377-4.
. 2012. Expression and functional characterization of retinoic acid-inducible gene-I-like receptors of mast cells in response to viral infection. J. Innate Immun. DOI: 10.1159/000343895.
. 2010. Peroxisomes are signaling platforms for antiviral innate immunity. Cell 141: 668–681. 2011. Mitochondrial-associated endoplasmic reticulum membranes (MAM) form innate immune synapses and are targeted by hepatitis C virus. Proc. Natl. Acad. Sci. USA 108: 14590–14595.
. 2012. STING mediates neuronal innate immune response following Japanese encephalitis virus infection. Sci Rep 2: 347.
. 2011. The influenza virus protein PB1-F2 inhibits the induction of type I interferon at the level of the MAVS adaptor protein. PLoS Pathog. 7: e1002067. Varga, Z. T., A. Grant, B. Manicassamy, and P. Palese. 2012. Influenza virus protein PB1-F2 inhibits the induction of type I interferon by binding to MAVS and decreasing mitochondrial membrane potential. J. Virol. 86: 8359–8366.
. 2011. The influenza virus PB1-F2 protein has interferon antagonistic activity. Biol. Chem. 392: 1135–1144.
. 2012. Virus-cell fusion as a trigger of innate immunity dependent on the adaptor STING. Nat. Immunol. 13: 737–743.
. 2010. Sphingosine 1-phosphate-metabolizing enzymes control influenza virus propagation and viral cytopathogenicity. J. Virol. 84: 8124–8131.